BUILT FOR ADVENTURES BIG AND SMALL. Want a motorcycle with this type of versatility, that won’t cost you an arm and a leg? That’s where Honda’s CRF250L and CRF250L Rally come in. They’re light, simple, fuel-efficient, and super dependable. They fit a wide range of riders and budgets. They work around your lifestyle, rather than asking you to adapt to someone else’s concept. And best of all, they’re both a blast to ride. Both use the same proven engine: a liquid-cooled fuel-injected single cylinder with electric starting. Both offer some pretty awesome fuel efficiency. Long-travel suspension front and rear is designed to soak up the bumps and rocks trail riding can toss your way, so you know it’s going to handle the lousy pavement you’ll encounter. Both are even available with optional ABS. Want to know which one is right for you? 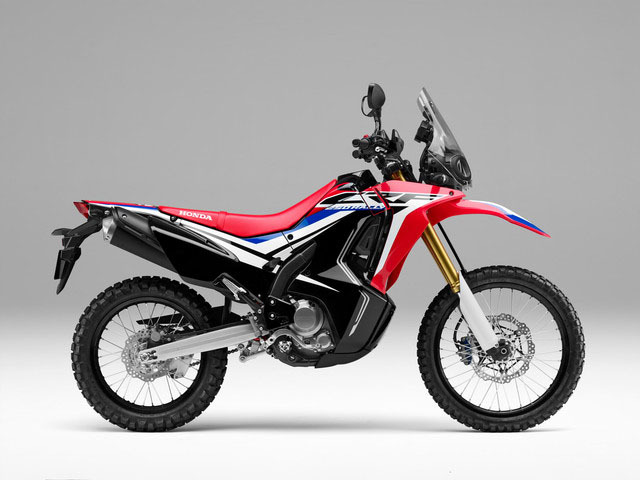 The CRF250L costs a little less, and is a little lighter. The CRF250L Rally adds a larger fuel tank, Dakar-inspired bodywork, handguards, a windscreen, a skid plate, and even more suspension travel. Both are an excellent choice as a first bike, a second bike, or even your only way to get around. Bottom line: The CRF250L and CRF250L Rally are two of the best forms of personal transportation you could ever hope for! 21-INCH/18-INCH FRONT AND REAR WHEELS: A 21-inch front and 18-inch rear wheel give you a wide selection of tire choices for everything from serious off-road trail riding to smooth on-road adventures. CARGO CONVENIENCE: Special cargo hooks make it easy to secure a light load to the passenger seat with bungee cords. It's just another one of the nice touches that help make these bikes so versatile. It also has a storage box on the left side for small items you need to keep secure. PASSENGER READY: With its long seat and fold-up frame-mounted passenger footpegs, the CRF250L models are fully equipped to carry a passenger so you can share the fun. PRO-LINK® REAR SUSPENSION: Thanks to our single-shock Pro-Link rear suspension, the CRF250L models deliver excellent comfort, traction and handling, while also improving rider confidence. The Rally’s suspension front and rear offers more travel and greater ground clearance. COMFORTABLE SEATING POSITION: With a long, motocross-style seat, you can move forward and back, left and right with ease, helping you navigate changing terrain in comfort. STRONG STEEL FRAME: A sturdy steel frame is strong and designed to survive in the real world of rough pavement or off-road trails. FUEL INJECTION: Fuel injection means the CRF250L models start right up, even in cold weather. Compared to a carbureted bike, it also helps reduce emissions and enhance performance and fuel efficiency. SINGLE-CYLINDER ENGINE: A single is the perfect choice for a bike like the CRF250L and CRF250L Rally. It's light, simple, returns excellent fuel economy, and features a broad powerband with plenty of low-revving torque—just what you want in this type of a motorcycle. ENGINE COUNTERBALANCER: Because it features a counterbalancer, the engine is a smooth runner. You get the narrow overall width and power advantages of a single along with the smoothness of a multi-cylinder bike. DIGITAL INSTRUMENTATION: The CRF250L's digital instrument cluster is integrated with the headlight visor, and gives you all the information you need: speedometer, clock, twin tripmeter, fuel gauge, and more. 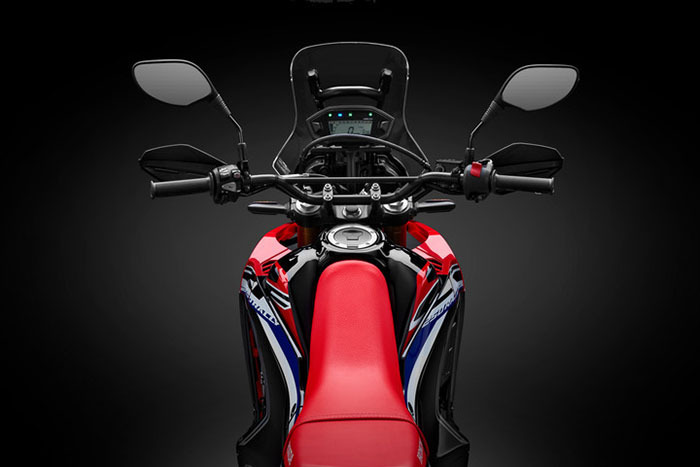 The CRF250L Rally’s digital instrument cluster tucks in behind the rally-style windscreen, just like the big Dakar bikes. RALLY-BIKE STYLING: The tall windscreen, the extra-coverage fairing and side panels, the blended, frame-mounted bodywork are all marks of a true rally machine. 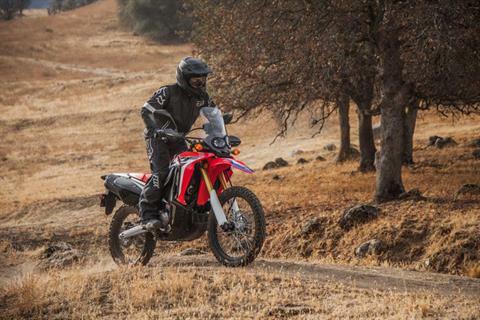 The 2018 CRF250L Rally looks great, but you’ll appreciate the extra wind- and weather protection too. INVERTED FORK: An inverted Showa fork features large 43mm sliders. That makes it strong and helps add to the CRF250L model's excellent handling in on or off-road conditions. DISC BRAKES: he CRF250L models feature front and rear hydraulic discs for excellent stopping power and brake feel, both for on-road and off-road use. 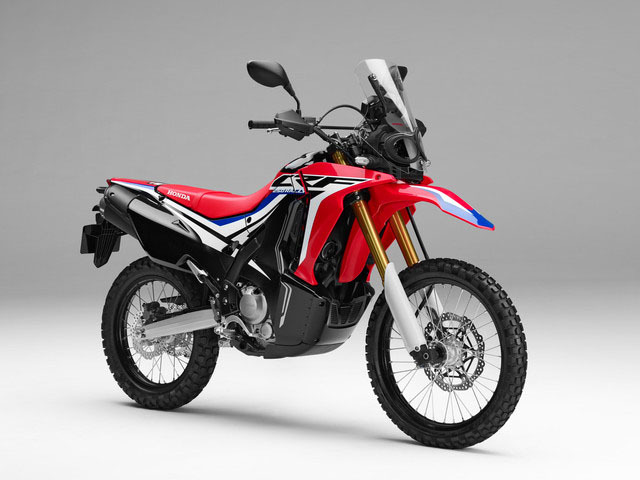 Both bikes are even available with optional anti-lock brakes (ABS), which you can de-select for dirt riding. ALWAYS WEAR A HELMET, EYE PROTECTION AND PROTECTIVE CLOTHING. NEVER RIDE UNDER THE INFLUENCE OF DRUGS OR ALCOHOL, AND NEVER USE THE STREET AS A RACETRACK. OBEY THE LAW AND READ THE OWNER’S MANUAL THOROUGHLY. For rider training information or to locate a rider training course near you, call the Motorcycle Safety Foundation at 800-446-9227. CRF is a registered trademark of Honda Motor Co., Ltd.